The nuns in this monastery belong to the Dominican Order. They were founded in 1206 by St. Dominic when he gathered together into the Monastery of St. Mary of Prouille in France, a small group of women converted to the Catholic faith from the Albigensian heresy. He associated these women who had left all for God with his Holy Preaching by prayer and penance. Thus the Dominican Nuns from the very beginning embarked on the work of reconciliation and renewal of the Church, spearheaded by their Holy Father St. Dominic. They still share today in the universal preaching and teaching apostolate of the whole Dominican order through their life of contemplation, liturgical prayer, study, work, and sacrifice. Essentially a mystery, their life is a collective, sacred sign and witness of Gospel living and an anticipation of the glorious Church without spot or wrinkle and immutable in its possession and contemplation of God. Theirs is a lifestyle radically lived for the sake of the Kingdom of Heaven: a way of living that witnesses to, proclaims, and serves the coming of God’s own rule of peace, justice, mercy and love initiated by Christ the Lord, and completed on His return. 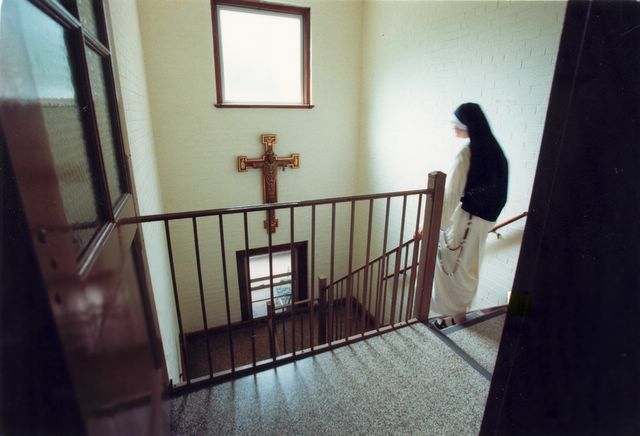 The specific mission of these nuns is unceasing prayer for the entire Church, for you and me, and for all men and women, for the Order, for all their benefactors, living and deceased, and the reconciliation of all in Christ. It is a pure, spiritual service in the form of praise, adoration, intercession, expiation and thanksgiving. By profession, the nuns are wholly consecrated to the Church and are called to the task of spreading the Kingdom of God in the world, using only the means of prayer and penance, which nevertheless are endowed with marvelous apostolic fruitfulness. The nuns harbor in their hearts the sufferings and anguish of all; they share to a more universal degree the fatigue and hope of all people; they raise the level of the spiritual life of the Church and are a sign to believers and unbelievers of the existence and presence of God, affirming the transcendent values of the life to come. WHY ARE THESE NUNS SMILING? : THE SECRET OF DOMINICAN JOY!